So lately and seemingly since the last update, I've been getting constsnt crashes to desktop. This will happen every hour or two and it's really testing my patience. My Nat typr is ope , I've done multiple hard/cod resets of my xbox and it hasn't solved anything. Anyone having the same issues or know a fix for this? I’m having similar issues, I got disconnected about 35 times in less than an hour last night. Not only that I can’t open my shine horn or featherlight inventory without the game crashing or open an obelisk or supply drop without getting dashboarded. Yeah its never done this to me before now so I'm wondering if the latest update is cauaing it. I found a way to fix it, try this out it worked for me and can now access everything no problem. 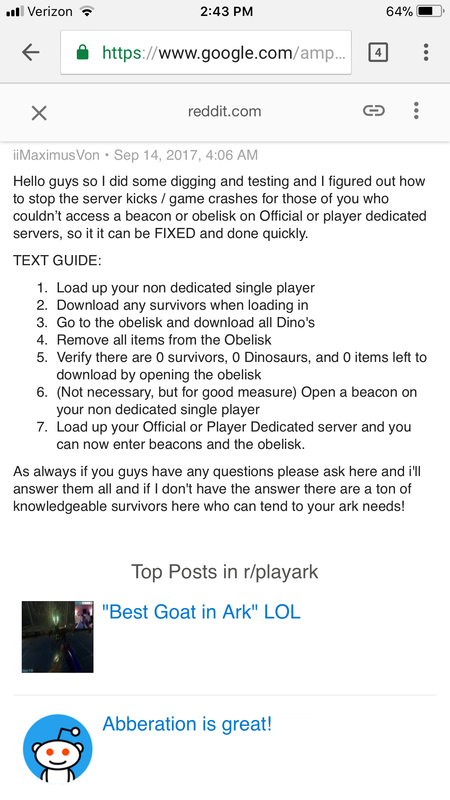 This is awesome but it's not an issue with the obelisks its just general random game kicks to dashboard when I'm playing in general. I could still try this though, can't hurt! I'm having the same issues on Xbox. For the past week (since the update) I have been dashboarding on average once every 15 to 20 minutes when I am near my base. I have 12 plant species X turrets (I know the issue with them was supposed to be fixed, not sure if it actually was), all set to wild dinos only. But I never really need to go near them or look at them. When I am away from my base, I rarely get dashboarded... if ever. It basically only happens when I'm within render distance of my base or standing in it. I speculate a bit that the constant texture pop-in issues that Ragnarok has, could be part of the problem. I've noticed that when the textures have issues loading in, my Xbox seems to start running louder than usual, and a few seconds later the screen goes black and I end up at the home screen. I had this a lot back when the Center map first came to consoles as well. The texture issues caused the Xbox to have memory loss, which then sent you to the dashboard... And I think this may be the same kind of scenario. I have 200% movement speed, a large base, and an above average amount of dinos. Textures do not like me on most maps, but on Ragnarok, it can be unplayable at times... im not epileptic, but I've felt like I was going to have a seizure on more than one occasion. I'd love to get an actual WC Xbox coder to join our Nitrado server, come to my base and see how long they can stay without dashboarding. Maybe doing something like that would give them an idea of how to fix the issue. A lot of what you said makes sense why the game may dashboard. I have noticed a few times that when I dashboard I may have too many dinos following me at one time which must overload the system. My friend told me that when his game dashboards he gets the same issue with the Xbox running louder and he can hear the fan. My xbox isn't close enough to me to notice a difference, but I am sure the same thing is occurring. As much as I would like to blame the textures/graphics or hard play, there are many times I am not even near anything (no bases or dinos) and I still dashboard randomly. Obviously we can all agree that it is was something that occurred with the update (before the most recent one) so two updates ago that has caused these issues. I have seen a lot of people reach out to Ark and Nitrado about the dashboarding on the Ragnarok map, but Ark/Wildcard & Nitrado have yet to give us any type of acknowledgement that is is an actual issue. It leaves me scared at times to take a flyer out or go into a harder territory full knowing I could dashboard and possibly die or even my dino die and be stuck in the middle of nowhere and potentially lose any gear I have on me as well.